The Siberian Husky is one of the oldest breeds of pup known, and it is recognizable by its thickly furred double coat, erect triangular ears, and distinctive markings. Huskies are a very active, energetic, and resilient breed came from the extremely cold and harsh environment of the Siberian Arctic. Siberian Huskies were bred by a tribe called Chukchi to pull heavy loads long distances through difficult conditions. With the help of Siberian Huskies, entire tribes of people were able not only to survive, but to push forth into terra incognita. The dogs were initially sent to Alaska and Canada as sled dogs but rapidly acquired the status of family pets and show dogs. When naming your Siberian Husky dog, you may consider the names associated with these elements: cold, ice, white, furred, sled, large, beautiful, and Santa. Another idea is to pick a name from those famous Siberian Huskies in history, and we believe these existing names are memoriable and fabulous. Siberian Huskies have been fine companions for over hundred years, and some of them have even become famous. Let's see what these famous Huskies are named. Balto was probably the most famous of all Siberian Huskies, and he gained in popularity with the story of the "Great Race of Mercy". In 1925, the Diphtheria breakout in Nome Alaska. Balto the sled dog led the dog team to deliver the life saving serum package to the town for almost 700 miles far away. The success of the expedition made Balto an overnight hero. 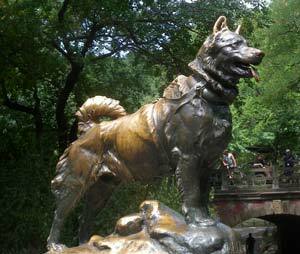 One year later a statue of Balto was erected in New York's Central Park. Charlie was reportedly the strongest Siberian Husky of all time, and he was able to pull a 3100 pound sledge in 1963. The story of Droopy was told by his brave rescuer, Mick Pawley. It took place on that rugged island, Pourquoi Pas. Mick and a companion was sledding across from the island to the hut on Horseshoe Island. Unfortunately, the dogs fell into a crevasse and Droopy dropped out of his harness. Mick abseiled 150ft down and found Droopy straddling the narrow walls on all four paws at the end of the rope, then the dog was saved. Fritz was another Siberian Husky dog of the 1925 serum run to Nome, and he was Togo's half-brother. During part of the journey, he was the co-leader of the team. In 1960, the US Army undertook a project to construct an under the ice facility for defense and space research. Mukluk was the only Siberian Husky with the team and he was also the unofficial mascot of the project. Steve was a hero Siberian Husky dog who travelled over 80 miles and finished the mission impossible lonely. He covered twenty-five miles up Lailemand Fjord to a glacier snout, then twenty-five miles or so over the Heim glacier; he then crossed the Jones Shelf ice to get to the little hut on Blaiklock Island; finally he travelled thirty miles down the last two fjords. Togo was another Siberian Husky lead dog in the 1925 serum race to Nome, he was often forgotten but no less important than Balto. Many people reward Togo as the real hero because he was leading the longest and most dangerous parts of the adventure.